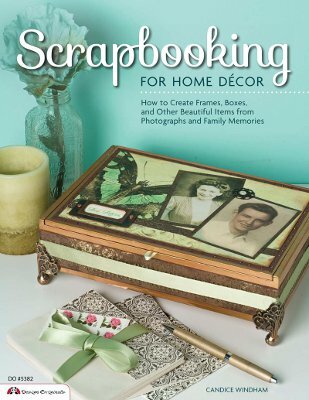 The editors here at FaveCrafts were lucky to get our hands on a copy of Scrapbooking for Home Decor, a must-read for any crafter looking to add a personal touch to their everyday decor. There are designs in here for crafters of all kinds, with full color images to demonstrate different techniques and projects. Best of all, author Candice Windham tells her own family’s story throughout this book with her crafts, showing crafters how you can include your favorite old family photographs and trinkets to make one-of-a-kind, truly personal works of craftsmanship. Your book includes several tips and tools of the trade; how did you pick up all these techniques? Just like anyone else – classes, books, internet, just plain old curiosity. I also belong to a rubber stamp club, the River City Stampers. We are a very diverse group from newbies to professional artists ( we boast four CHA Designer members!) Our 35 members meet monthly and share ideas and projects, so I’ve learned a lot from them. I’ve always been interested in new techniques and never met a tool I didn’t like! When did you start scrapbooking? I actually began as a child. My Aunt Carolyn, who was only ten years older than me, kept scrapbooks on her favorite singers and movie stars. I tried to do everything she did, so a scrapbooker was born. Of course, since I used whatever papers my dad brought home from his printing shop and usually a paste made of flour and water, those pieces have long since fallen victim to the acid/lousy adhesive curse. I’d give anything to still have them. I love three dimensional projects. I also like things that have a purpose, thus my tendency toward boxes and containers. Beautiful papers (especially Graphic 45),Golden transparent acrylic paint, Viva Décor metallic finishes. Where did you get the idea to apply scrapbooking to home decor? I like for my work to be out in the open. I have many scrapbooks, but can’t remember the last time anyone took one off the bookshelf to look at it. I also love my family photos and use them in my art every chance I get. I actually teach a class using transparent acrylics and photocopies of family photos to create very large, personal paintings. You talk about the background of the pictures you use. What kind of inspiration does your family serve in your crafting? I have very few old family photos, but the ones I have are so special. My style is also slightly on the vintage side, so these old pictures mean the world to me. Now, if you ask my son about photos, he’ll tell you that there was always a camera in his face growing up! Those will come into the picture (no pun intended) soon. Is there a particular project in this book that you find special? The cover project, Love Letters. My parents had a love story that lasted all their lives. When I saw that it had been selected for the cover shot, I actually sat down and cried. They would have been so proud. What do you think is the best advice for crafters new to scrapbooking? Don’t feel that you have to have all the latest and greatest tools and products. This is the voice of experience speaking. These things take up valuable real estate in your craft area, so be sure you really need it before you buy it. On the other hand, do your homework. Buy the best you can afford in scissors, punches and cutters as well as adhesives. These will pay off in the long run. I have a paper trimmer that was pricey ($200 +) but I’ve never had to replace a blade (self-sharpening) or have it re-calibrated to cut straight. I’ve owned it for more than ten years, and this baby gets a workout almost every day. I have even cut mat board with it (but I don’t think the manufacturer would like that!). What do you want crafters/readers to gain from your book? A love of crafting and family heritage, and when i say “family”, I mean extended family as well. I have a couple of projects in the works using photos from my high school days with my BFFs. I also hope it will encourage people to think outside the box. The Grandma’s Garden piece is a perfect example of that. I had a lot of test tubes left over from a class I taught, a wonderful photo on my sister and me with our great grandmother holding flowers we had brought for her, and we were standing in front of a large Camellia in her backyard. I remembered how she was always sharing cuttings with my grandmother, and the project just came to life. Also, the tools chapter offers insight in tool selection, and the techniques chapter shows different ways to achieve results using what you have on hand as opposed to running to the craft store every day. Are there any techniques or crafts that you think will be popular in the future? I think the trend toward home decor will continue as well as the vintage look. I am continually seeing new techniques for creating an aged look on the most modern, up-to-date objects. With the Baby Boomers reaching retirement years and programs such as Who Do You Think You Are? increasing interest in genealogy, there is an increased desire to make sure our descendants know our stories, so scrapbooking, whether it’s in a book, on a wall or sitting on a side table, will continue be popular. If you’d like to find out more about Candice, her book, and her crafts, be sure to check out her blog!